TPLF: Using Unsuspecting Refugees for Political and Military Agenda is a Crime. Photo: Ethiopian refugees in Eritrea. Many Eritreans have already written about the Tigrai People Liberation Front’s (TPLF’s) cruel and sinister agenda against Eritrea and its people. Also, it is important to remember that not long ago TPLF leaders have openly expressed their plan to weaken Eritrea to a point they would be able to take its Sea Cost with little or no resistance and dismantle the rest of the country into ethnic Hamlets. Moreover, it is public knowledge that, to achieve its agenda TPLF has prepared Political, Economic and Military strategy and allocated millions of dollars for its implementation. In addition to the unfair and unjust sanctions and naked military aggression against Eritrea, in partnership with some clueless western governments, TPLF devised a strategy to empty Eritrea from its youth and deny its productive labor power. Such sinister agenda was supported by continuous propaganda from Radio Woyane and Radio Wogahta, both owned and operated by the TPLF minority regime. However, recently the western world that conspired with TPLF to settle every Eritrean refugee who crossed the border to Tigrai is closing its doors. Thus, refugee settlement is slowing down and ultimately it is more likely that some of the Eritrean refugees who left their country to Tigrai in the hope of being resettled to another western country will not be resettled at all. It is in the backdrop of such scenario that TPLF is planning to use them for political and possibly military agenda. TPLF and cohorts perfectly know that the foreign policy of Eritrea is made in Eritrea, not in refugee camps in Tigrai or a “Song for peace event” in Addis Ababa. Therefore, the objective of the recent “Song for Peace” event, initiated by TPLF personalities who are major sworn enemies of Eritrea, Tsadikan Gebretransaie and Sibhat Nega, is simply another ploy to turn hopeless Eritrean refugees who languished in Tigrai refugee camps for years into opposition groups and use them for propaganda and possibly military purposes. 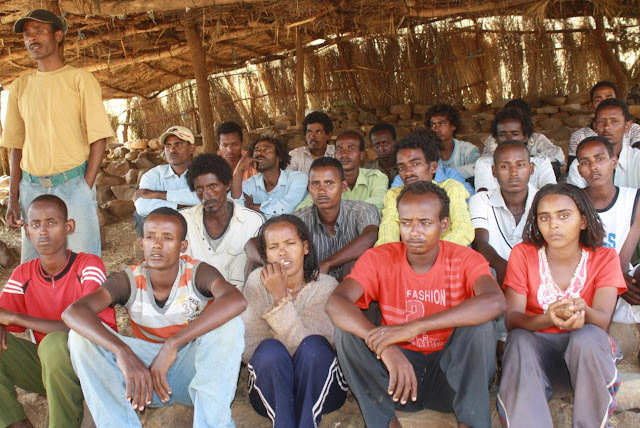 Over the years TPLF has created more than 25, ethnic and religion based, so-called Eritrean opposition groups. However, to the disappointment of TPLF, none of them could deliver what TPLF expected from them. The main reason for such failure is because Eritreans did not go to Tigrai refugee camps to get military Training and come back to Eritrea to fight against their brothers and sisters. The truth is they went to Tigrai because TPLF and its partners in crime promised them a better life through resettlement to a third western country. Ultimately when Eritrean refugees in Tigrai camps discover that there is no chance for them to be resettled to a third country anymore, they will likely find a way to go back to their country to stand with their brothers and sisters side by side against any possible future TPLF aggression on Eritrea. Such news is a bad news for TPLF because not only the return of Eritreans to their country will be a big blow to its sinister agenda, but also will make it lose the significant amount of foreign currency it is collecting in the name of Eritrean refugees. That is why the issue of Eritrean refugees in Tigrai camps has become a pressing issue for TPLF heavyweights and they are working hard to use them not for peace but for a dangerous and destructive purpose. The key point is TPLF is allergic to peace because it cannot survive and flourish in peace. That is why the Ethiopia that we all see nowadays is in turmoil of ethnic conflict not by chance but by TPLF’s sophisticated design. In the era of modern society, when hundreds of thousands of Ethiopians are living and working in every corner of the world, TPLF denies citizens in Ethiopia the right to live in the land they inherited from their ancestors. It snatches land from the Ormos people who lived around Addis Ababa all their life and distributes it to loyal Tigrian operatives who want to build businesses and residential homes at the cost of the lively hood of the Oromo people. When the Oromos oppose the land grab, oppression and exploitation, TPLF arms the Ethiopian Somalis to get their women and children raped and killed and ultimately expelled from the land of their ancestors. It snatches land from Gondar and Wollo to give Tigrai a fertile land and access to Sudan. When the Amhara people oppose the land seizure, TPLF conspires with the Gambellas to push the Amhara’s out of the region they called home for generations and force them to beg for food in the streets of Addis Ababa. When frustrated Oromo and Amhara youth vent their frustration in the streets of Ethiopia peacefully, TPLF executes them with snipers in a broad light and no Major Western Media dares to cover the carnage. The crux of the matter is TPLF needs to ferment conflict between Ethiopian communities who have lived in peace and harmony for generations so that they cannot cooperate and turn against it. Given such TPLF history, if there is any Eritrean who believes the TPLF minority regime will give up the occupied Eritrean Territories for the sake of peace, then he/she needs to visit a psychiatrist. If TPLF can make peace with Eritrea, why did it decide to construct a railway from Djibouti to Tigrai? Is that because Assab and Masswa are far from Tigrai? If TPLF has an intention to make peace with Eritrea why did it decide to re-settle Tigrians in occupied Eritrean Territories? If TPLF has an intention to make peace with Eritrea why is it working hard day and night to disarm Eritrea and empty its youth? The truth is TPLF will continue to sow hatred, and create havoc and destruction until the Ethiopian people with the help of their Eritrean brothers and sisters develop the capacity to take their country back. That is why it is important for all Eritreans not to be fooled by TPLF’s maneuvers to establish another so-called Eritrean opposition group through the “Song for peace” Mantara. Although we perfectly know that such TPLF project will end up being another failure, it is important for the unsuspecting Eritreans to remain ahead of the game. Not only the TPLF spearheaded and honey quoted poison “Agazian agenda” will never achieve its objective to divide Eritrean Christians and Muslims, but also it will not have a chance to set foot in Eritrea. If TPLF wants peace, I do not really believe so, there is no need for another boring song. The procedures for peace between Ethiopia and Eritrea are clearly laid out in the binding Ethiopia and Eritrea Boundary Commission decision signed by the two countries. 1. Allow the demarcation of the Border to proceed. 2. Settle a compensation for war-related damages as stipulated by the compensation commission and finally. 3. At the will of the two countries start discussion for normalization. Zele Alemawi Kibri Ni Siwaatna.